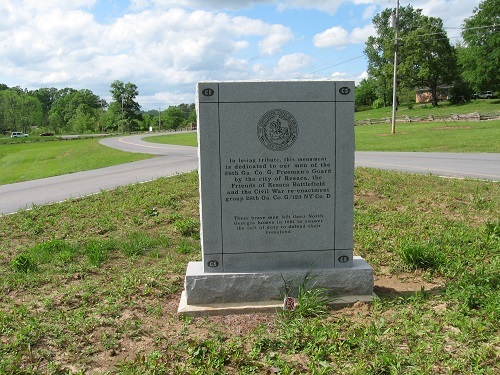 In 2009, our unit voted to erect a monument to the 28th Georgia, Company G, to be placed somewhere in the Resaca, Georgia area. 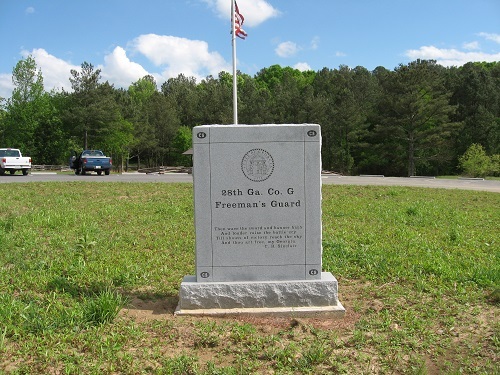 The 28th Georgia, Company G, was recruited from Gordon and Taylor Counties, so it was fitting to place a monument to them in Resaca. In 2014, after five years of fundraising, we erected a monument to the 28th Georgia, Company G, at the newly opened Fort Wayne Civil War Historic Site in Resaca, Georgia. The monument stands 5' 10" tall and is 5' across at the base. It has been a tremendous honor for us to tell the story of the 28th Georgia and we hope that this monument will continue to tell their story for generations to come. 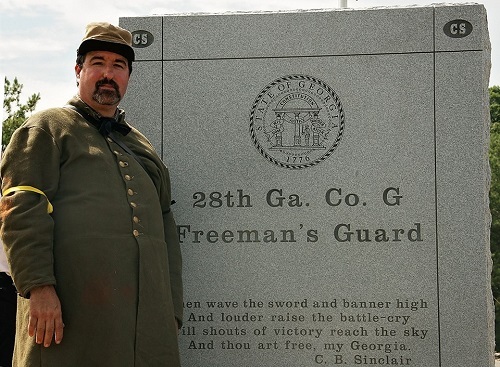 On Saturday, August 2, 2014, our unit conducted the monument dedication service for the new 28th Georgia Company G monument located at the Fort Wayne Civil War Historic Site in Resaca, Georgia. The members of Company G were recruited from Gordon and Taylor Counties. This is the first monument to Company G or to the 28th Georgia anywhere. This monument was a five year undertaking by our unit. Special thanks goes out to everyone who contributed to this project and to Dennis Melville for spearheading this project and seeing it through to the end! The following poem was commissioned for the 28th Georgia monument dedication and read by the author during the event. and having served with southern pride-our weapons sleep today. 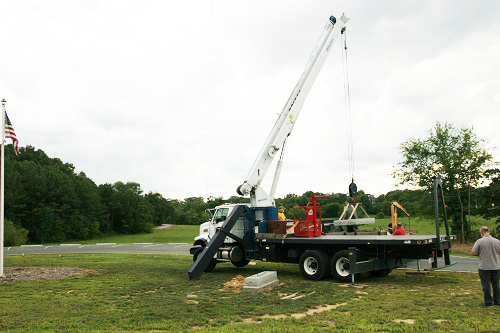 Here is the installation of the 28th Georgia Company G monument at the newly opened Fort Wayne Civil War Historic Site in Resaca, Georgia in 2014. The monument stands 5' 10" tall and is 5' across at the base. 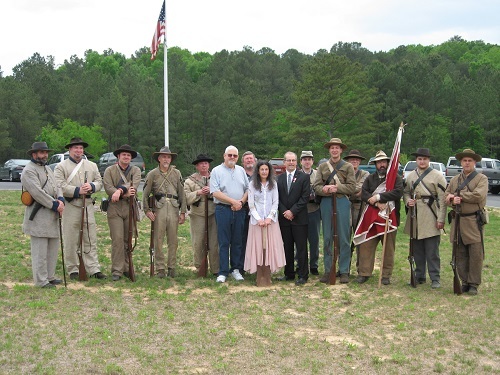 Here is the groundbreaking ceremony in 2014 for the construction of the 28th Georgia Company G monument at the newly opened Fort Wayne Civil War Historic Site in Resaca, Georgia. 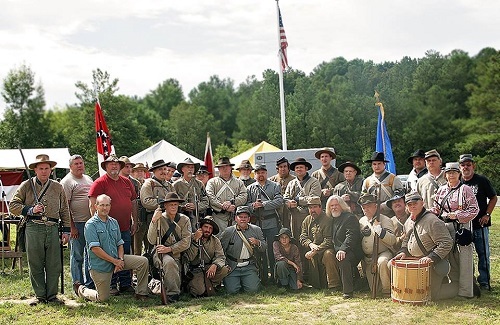 The photo shows members of the 28th Georgia / 123rd New York Volunteer Infantry Civil War Reenactors, plus Ken Padgett, Melea Tennant, and Jule Medders in the center.